Cloning is simpler when you can see exactly what you are doing. See multiple views of a DNA sequence. Customize the display of enzyme sites, features, primers, ORFs, DNA colors, and more. The map can be in circular or linear format. Take advantage of SnapGene’s efficient data handling to scan large DNA sequences with thousands of annotated features. See multiple views of a protein sequence. Customize the display of regions, sites, bonds, and sequence colors. 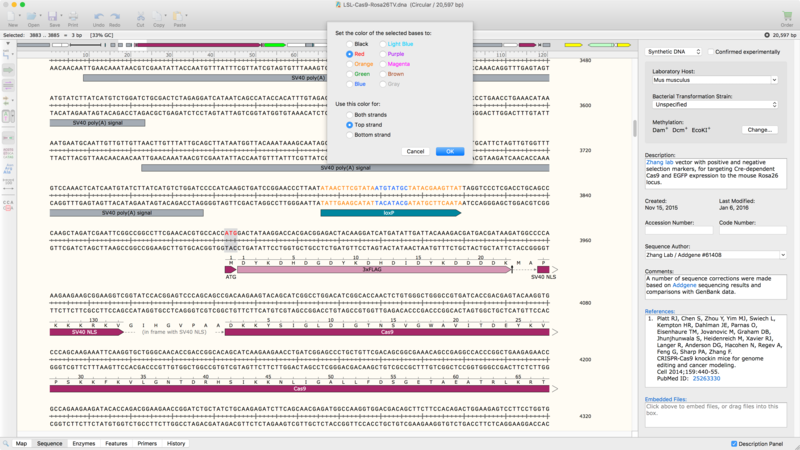 Easily edit DNA and protein sequences. Make insertions, deletions, replacements, and case changes. When a sequence is copied and pasted, features are automatically transferred. Set a selected DNA or amino acid sequence to one of ten colors. Color the two DNA strands or the protein sequence. The colors are visible in both Map and Sequence views. Annotate common features automatically, or annotate novel features manually. Find common features in your DNA sequence using SnapGene’s extensive database. Additional features of your choosing can be added to a custom database. Automatically generate a rich graphical history of every sequence edit and cloning procedure. See exactly how your sequencing results compare to your simulation. Prevent waste and frustration by catching planning errors before they happen. Plan your cloning easily, and simulate as fast as you can think. Import sequences and annotations from common file formats.